expect to be absent from the City of Cranbrook on general voting day and at the times of all advance voting opportunities. Before 4:00 pm on October 19, 2018 you must submit the following information to the Chief Election Officer (or designate)’s office in person (City of Cranbrook City Hall, 40 10th Ave. South ), by mail (City of Cranbrook, City Hall 40 10th Ave. South, Cranbrook BC V1C 2M8), telephone (1-866-201-3638), or email (electionsofficer@cranbrook.ca ). 5. To ensure you receive the correct registration application form in your package, you must indicate whether you are going to be registering as a resident or non-resident property elector. Mail ballot packages will be sent out commencing on or about October 1st, 2018. 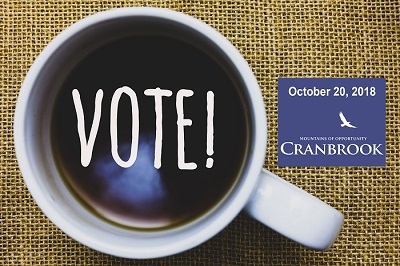 To be counted, your mail ballot must be received by the Chief Election Officer (or designate) in Cranbrook no later than 8pm on October 20, 2018. 2. By hand to Sarann Press (or designate), Chief Election Officer, at Laurie Middle School Gymnasium, 1808 2nd Street South, Cranbrook, BC prior to 8pm on October 20, 2018.
is not otherwise disqualified by law from voting. RESIDENT ELECTORS may register on Voting Day at the Polling Station, if they meet these qualifications and provide two pieces of identification (at least one with a signature). Picture identification is not required. The identification must prove both residency and identity. (f) has received the written consent of a majority of the registered owners of the property designating you as the one who may vote (only one person may vote on the property qualification no matter how many owners there may be). 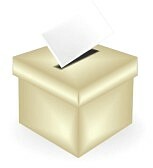 NON-RESIDENT PROPERTY ELECTORS may register on Voting Day at the Polling Station, if they meet the qualifications set out, have two pieces of identification (at least one with a signature to prove identity), proof of ownership of the property and the WRITTEN CONSENT OF A MAJORITY OF THE REGISTERED OWNERS OF THE PROPERTY designating you as the one who may vote.